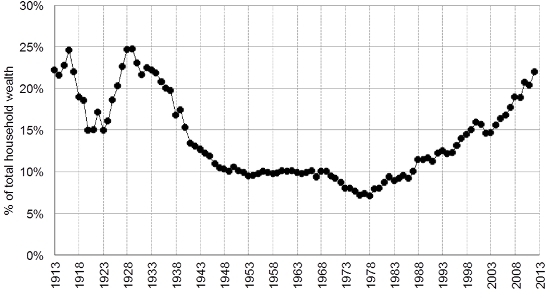 There is no dispute that income inequality has been on the rise in the United States for the past four decades. The share of total income earned by the top 1 percent of families was less than 10 percent in the late 1970s but now exceeds 20 percent as of the end of 2012. A large portion of this increase is due to an upsurge in the labor incomes earned by senior company executives and successful entrepreneurs. But is the rise in U.S. economic inequality purely a matter of rising labor compensation at the top, or did wealth inequality rise as well? Before we answer that question (hint: the answer is a definitive yes, as we will demonstrate below) we need to define what we mean by wealth. 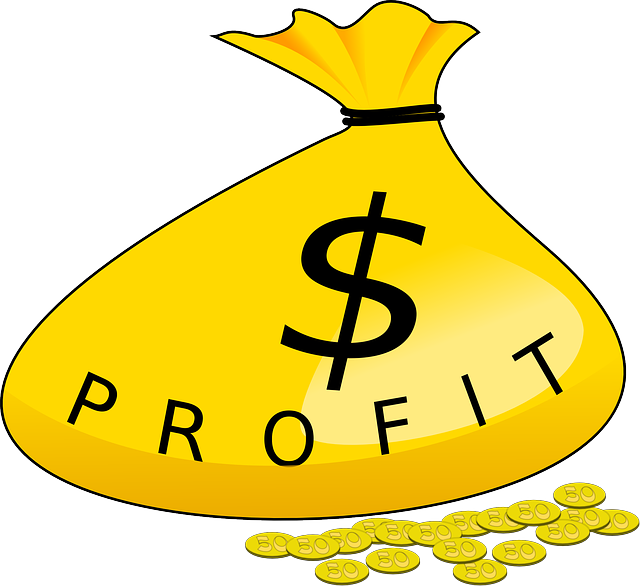 Wealth is the stock of all the assets people own, including their homes, pension saving, and bank accounts, minus all debts. Unfortunately, there is much less data available on wealth in the United States than there is on income. Income tax data exists since 1913—the first year the country collected federal income tax—but there is no comparable tax on wealth to provide information on the distribution of assets. In our new working paper, “Wealth Inequality in the United States since 1913: Evidence from Capitalized Income Tax Data,” we try to measure wealth in a new way. We use comprehensive data on capital income—such as dividends, interest, rents, and business profits—that is reported on individual income tax returns since 1913. We then capitalize this income so that it matches the amount of wealth recorded in the Federal Reserve’s Flow of Funds, the national balance sheets that measure the aggregate wealth of U.S. families. In this way we obtain annual estimates of U.S. wealth inequality stretching back a century. 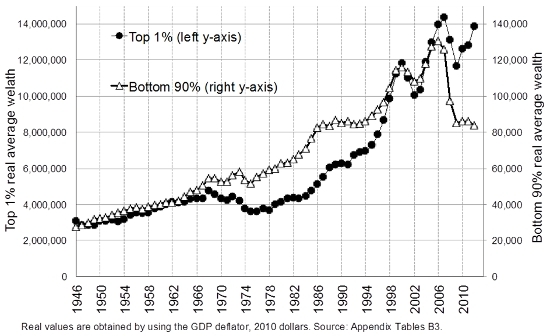 Wealth inequality, it turns out, has followed a spectacular U-shape evolution over the past 100 years. From the Great Depression in the 1930s through the late 1970s there was a substantial democratization of wealth. The trend then inverted, with the share of total household wealth owned by the top 0.1 percent increasing to 22 percent in 2012 from 7 percent in the late 1970s. (See Figure 1.) The top 0.1 percent includes 160,000 families with total net assets of more than $20 million in 2012. Figure 1 shows that wealth inequality has exploded in the United States over the past four decades. The share of wealth held by the top 0.1 percent of families is now almost as high as in the late 1920s, when “The Great Gatsby” defined an era that rested on the inherited fortunes of the robber barons of the Gilded Age (Our data is based on tax data, meaning the unit of analysis is tax units. But tax units and families are similar enough that we refer to families throughout the text). The growing indebtedness of most Americans is the main reason behind the erosion of the wealth share of the bottom 90 percent of families. Many middle class families own homes and have pensions, but too many of these families also have much higher mortgages to repay and much higher consumer credit and student loans to service than before. For a time, rising indebtedness was compensated by the increase in the market value of the assets of middle-class families. The average wealth of bottom 90 percent of families jumped during the stock-market bubble of the late 1990s and the housing bubble of the early 2000s. But it then collapsed during and after the Great Recession of 2007-2009. (See Figure 2.) Since then, there has been no recovery in the wealth of the middle class and the poor. The average wealth of the bottom 90 percent of families is equal to $80,000 in 2012—the same level as in 1986. In contrast, the average wealth for the top 1 percent more than tripled between 1980 and 2012. Figure 2 – Average wealth of families in the bottom 90 percent and the top 1 percent of the wealth distribution, in constant 2010 U.S. dollars, 1946-2012. How can we explain the growing disparity in American wealth? The answer is that the combination of higher income inequality alongside a growing disparity in the ability to save for most Americans is fuelling the explosion in wealth inequality. For the bottom 90 percent of families, real wage gains (after factoring in inflation) were very limited over the past three decades, but for the top 1 percent real wages grew fast. In addition, the saving rate of middle class and lower class families collapsed over the same period while it remained substantial at the top. Today, the top 1 percent families save about 35 percent of their income, while bottom 90 percent families save about zero. If income inequality stays high and if the saving rate of the bottom 90 percent of families remains low then wealth disparity will keep increasing. Ten or twenty years from now, all the gains in wealth democratization achieved during the New Deal and the post-war decades could be lost. While the rich would be extremely rich, ordinary families would own next to nothing, with debts almost as high as their assets. What should be done to avoid this dystopian future? We need policies that reduce the concentration of wealth, prevent the transformation of self-made wealth into inherited fortunes, and encourage savings among the middle class. First, current preferential tax rates on capital income compared to wage income are hard to defend in light of the rise of wealth inequality and the very high savings rate of the wealthy. Second, estate taxation is the most direct tool to prevent self-made fortunes from becoming inherited wealth—the least justifiable form of inequality in the American meritocratic ideal. Progressive estate and income taxation were the key tools that reduced the concentration of wealth after the Great Depression. The same proven tools are needed again today. There are a number of specific policy reforms needed to rebuild middle class wealth. A combination of prudent financial regulation to rein in predatory lending, incentives to help people save—nudges have been shown to be very effective in the case of 401(k) pensions—and more generally steps to boost the wages of the bottom 90 percent of workers are needed so that ordinary families can afford to save. Emmanuel Saez is a professor of economics and director of the Center for Equitable Growth at the University of California-Berkeley. Gabriel Zucman is an assistant professor of economics at the London School of Economics.This article is based on the working paper, ‘Wealth Inequality in the United States since 1913: Evidence from Capitalized Income Tax Data’ , and first appeared at the Washington Centre for Equitable Growth.